3 in 1. Optimize spaces with a 3-service bar group, ice crusher, lever-operated citrus juicer and blender. 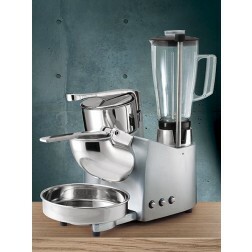 The Ceado, with the G110 model, offers the most common automatic juicer on the market, alongside a classic ice crusher and a blender to unleash the imagination in the preparation of original cocktails.